An Ashland, Ky. police officer following Wednesday's snowfall has been caught in the act of going beyond the call of duty. Based on a Facebook posting, two members of the Eliott Neighborhood Watch group photographed an Ashland officer who stopped to clear the driveway of an elderly resident. Officer T. Patrick was "caught" in the act of spreading kindness Wednesday. The resident wasn't aware and was alerted by her neighbors that an Ashland Police Officer stopped by to make sure she could get her car out. 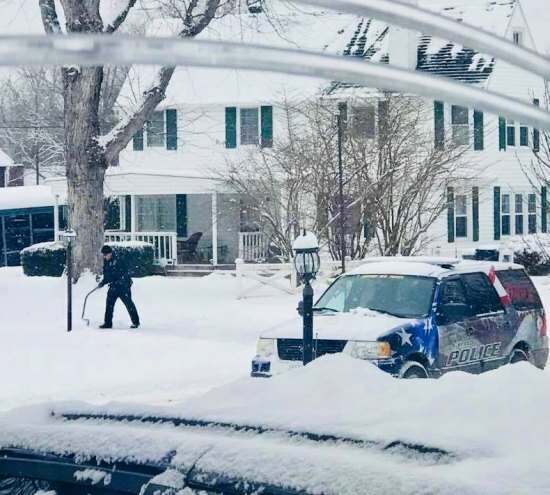 Deb from the Neighborhood watch, contacted Ashland's Police Department and said, "My neighborhood is grateful to a very kind officer who shoveled the driveway of an elderly lady today. We would like to throw some credit his way..."
The Department thanked Officer Patrick on its FB page. Glad he thought of the "pay it forward" and "magnificent obsession" philosophies of doing a good deed anonymously and just asking that someone else do one in return.